SPEARFISH, S.D. – Makaleb McInnis made four late free throws as the Black Hills State University men's basketball team edged Regis University, 75-74, on Friday evening. Fraser Malcolm recorded his third double-double of the season, scoring 17 points and pulling down 10 rebounds, while Dez Stoudamire also had 17 points to lead the Yellow Jackets (5-4, 2-3 RMAC). McInnis finished with 11, including going 4-for-4 from the charity stripe. With less than 10 seconds left, the Green and Gold trailed, 74-71. However, McInnis was fouled and sent to the line, sinking two free throws to draw the home team within one, 74-73, with just four seconds remaining. On the inbound pass, McInnis stole the ball, getting fouled in the act. With BHSU in the double bonus, the junior transfer stepped calmly to the line, hitting both shots, and putting the Yellow Jackets up by one, 75-74, with three seconds to play. 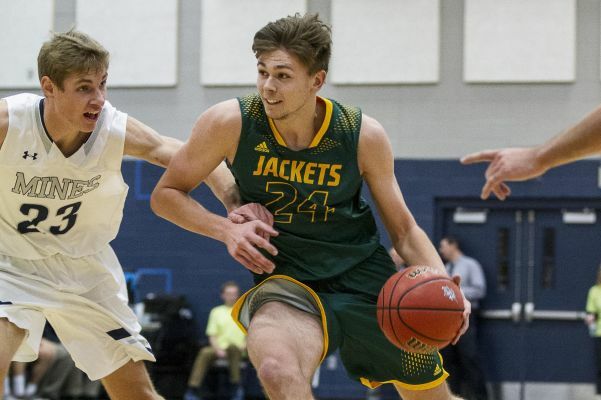 Christian Little drove the ball down the court for the Rangers (8-2, 3-2 RMAC), but his wild layup as time expired was no good, sealing the win for the Jackets. "I am very proud of the resiliency shown by the team tonight. To be down 21 and continue to compete the rest of the way is a difficult task," said head coach Jeff Trumbauer. "Our guys showed a toughness and played a style that we need to play to have success. We made clutch plays and fought to the final buzzer. I couldn't be more proud of the team effort." Regis led by as many as 21 points in the first half, and held a 45-32 lead at halftime. As the second half began, BHSU slowly chipped away at the Rangers' lead, pulling within two with less than 10 minutes to play. RU tried to keep the Green and Gold at arm's length, but defensive stops, excellent free throw shooting, and timely three-pointers by Malcolm and Stoudamire left the Yellow Jackets with their chance to win it in the final minute. BHSU shot 48.0 percent from the field (24-for-50), while RU was 40.3 percent from the floor (25-for-62). The Yellow Jackets were 8-for-17 (47.1 percent) from beyond the arc, while the Rangers were 8-for-19 (42.1 percent) on three-pointers. BHSU was 19-for-20 (95.0 percent) from the free throw line. The Green and Gold were outrebounded, 34-32. For the Rangers, Jarrett Brodbeck (16), Dexter Sienko (13), Christian Little (11), and Ty McGee (13) all scored in double-figures. The Green and Gold next host Chadron State on Saturday, December 16. The RMAC match-up is slated to tipoff at 6 p.m. Meanwhile, Lyndzi Rich's 22-point effort carried the Black Hills State University women's basketball team past Regis University, to end a two game losing streak, on Friday night, 65-58. The Yellow Jackets improve to 9-2 overall and 3-2 in conference play, while the Rangers slip to 4-6 overall and 3-2 in conference. It was a well-fought battle between the two teams all the way to the end. In the first quarter, the Rangers jumped out to a 3-0 lead two minutes into the game. Remi Wientjes responded, hitting the only three-pointer of the night to tie the contest. With 5:39 remaining in the first, Regis had a five-point lead, 10-5, over the Yellow Jackets and increased that lead to seven with three minutes to go. However, BHSU cut in on the lead and trailed by one at 15-14 at the end of the first. Through the second quarter, neither team had the advantage, as both teams traded off points to notch it 30-all at halftime. After the intermission, the Green and Gold really found their momentum. Rachel Erickson grabbed a steal and tipped it up to Keely Bertram to score the go-ahead point on the fast break to lead, 32-30. About a minute later, the Rangers tied it back up with a layup by Whitney Jacob. With 4:23 remaining in the third, the Yellow Jackets had a three-point lead at 39-36 off a free throw by Rich. However, Regis was not giving up, as it tied the score back at 43-all at the end of the third. In the fourth quarter, the Green and Gold got on fire with Bertram grabbing a steal and scoring the go-ahead point on a fast break to lead, 45-43. However, Chante Church answered back knocking one in from downtown to grab the one-point lead, 46-45. From there, the Yellow Jackets grabbed the lead back off another fast break by Bertram, and they never gave it up. Regis managed to tie it one last time at 51-all, but it would not be enough, as Black Hills State closed it out, 65-58. "We set the tone with our defense," said head coach Mark Nore. "We had a great mindset. It was a very fun game to coach and the gals should be proud of that one." Rich led all the starters, scoring 22 points off the bench while Erickson and Bertram each notched 10 points. The Yellow Jackets shot 49 percent (24-of-49) from the field and 57.1 percent (16-of-28) from the line. On defense, Katie Messler led the way, grabbing seven rebounds. Black Hills State returns to action on Saturday, December 16, hosting Chadron State College. Tipoff is set for 4 p.m.